A two-week blitz to permanently repair some of Plymouth's worst potholes has just got under way, ahead of a major road patching and resurfacing programme for the city. Eight pothole gangs have been deployed for the blitz, which will focus on repairing 'category one' potholes (those more than 40mm deep) that have been reported by the public. Amey has been making around 120 permanent repairs and 90 temporary repairs a week on average but with better weather conditions and extra teams on the ground, it is making a dedicated push to complete as many permanent repairs as possible – ahead of a citywide programme of patching and resurfacing on roads that have been the most severely damaged over the winter. Victoria Hutchins, Watchman-in-Chief for Amey said: "The extra resources allocated by the Council have enabled us to install a 'hotbox' at our depot, which is making a big difference to the way we carry out repairs. The hotbox is a large heated storage unit that keeps asphalt hot after it is delivered so it can be used on demand by our pothole and patching gangs. In most cases we can now make a permanent repair first time, instead of temporarily filling the pothole and having to schedule in a permanent repair later. This means higher quality and longer lasting repairs – and better value for money." The two-week pothole blitz will finish on Friday 7 June. Details of the road patching and resurfacing programme, which is due to start in July, will be announced in a few weeks. We’d like to set the record straight regarding the bus lane on Tavistock Road and the reasons why we’ve temporarily suspended camera enforcement there. The road markings and signage that are in place on this bus lane are completely in line with Department for Transport regulations and were externally audited before we started enforcement. The changes we are making are not to correct markings, but to reduce the gap in the bus lane where traffic turns into the car wash (which used to be a petrol station). We’re doing this because one of the adjudicators for the Traffic Penalty Tribunal (TPT) feels the gap doesn’t need to be as long for traffic turning into the car wash as it did for traffic queuing for the petrol station. His view doesn’t appear to be shared by any of the other TPT adjudicators considering appeals against fines issued on Tavistock Road, who have all been satisfied with the arrangements in place. As a wider measure to help motorists (not linked to this case and not a legal requirement), we are also planning to apply red surfacing on the bus lanes where bus operators report the most abuse. 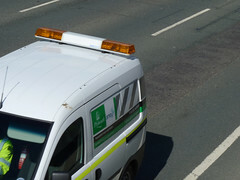 Camera enforcement was not introduced to generate cash but to deter motorists from straying into bus lanes and gates, improve journey times and – most importantly – make Plymouth’s roads safer for everyone. Before starting bus lane enforcement we ran a long advertising campaign and promoted the camera locations extensively. The number of fines has fallen steadily since the cameras were introduced and fewer than 0.1 per cent of all drivers – that’s 1 in every 1,000 – now fall foul of the regulations. One of the city’s key visitor gateways has been given a bright new look with the installation of high quality, wall-sized images of the waterfront and city centre. Photographs of Smeaton’s Tower on the Hoe, the Royal William Yard, the British Firework Championships viewed from Plymouth’s historic Barbican and Sutton Harbour, the West End and Drake Circus have been scaled up to give visitors a warm welcome to the city. Funded by a partnership of Plymouth City Council, Plymouth Waterfront Partnership and Plymouth City Centre Company and designed by waterfront businesses, the large pictures showcase key visitor locations to encourage increased footfall and include information on how long it takes to walk to each destination. The wall visuals are the latest in a series of improvements to cleanliness and signage at Bretonside. Many areas of the bus station have been redecorated, new information and direction signs have been put up and pigeon roosting deterrents have been installed. Summer service 54, Plymouth to Bovisand to be operated by Jacketts coaches this year!!! Torpoint trident spotted today sporting DEVON livery. That puts the devon / cornwall guessing game to bed then! Shame tamarlink is no more though! I Think they should do away with First Devon etc altogether.. relaunch Western National name, First western National covering Devon/Cornwall/Somerset, and have a complete new identity, run locally!